Pop On Pals is a new line of playsets that gives toddlers the power to create their own pals and pets by mixing and matching modular pieces. The pieces "pop" together with a signature sound that encourages kids to develop their imaginations and their fine motor skills. I see them as a cross between Weebles and Mr Potato Head, scaled for younger children to be able to manipulate. 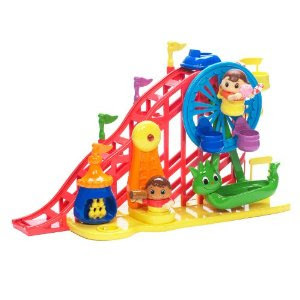 We received the Pop On Pals Amusement Park Playset pictured above to review. It has plenty of bells and whistles, literally, with lights and music that toddlers can activate by putting the Pop On Pal into one of five points. Jasper liked the sounds and the ability to spin the ferris wheel and push the dragon boat swing but I wished that it had included more than one Pal so we could have played with the interchangeability more. The Pop On Pals are recommended for ages 2-4 but I think they would be more successful with younger toddlers. Jasper tends to be more interested in things that go fast and crash these days. Sigh. He wanted to keep the playset but I decided to donate it to our Parents as Teachers playgroup that serves kids 0-3. I think they will get more use out of it in the long run, especially if we add on a couple of the Pal, Pet and Vehicle playsets later in the year. Disclosure: We received the Pop On Pals playset shown above to facilitate this review. We were asked to share our unbiased opinions and no compensation was provided.